Fig. 1. 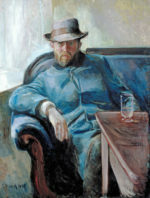 Edvard Munch, Hans Jæger (1889), oil on canvas, 109 x 84 cm (Woll 174). The National Museum, Oslo, NG.M.00485. In the second half of the 19th century, drinking was acknowledged as a serious social problem in Norway, and a temperance movement was gaining strength in many parts of the country. The trouble was mainly regarded as affecting the lower classes, however, and while regulations were introduced to control the sale of spirits, the bourgeoisie remained free to enjoy their wine. Toward the end of the century, drinking also began to be regarded as an individual problem.